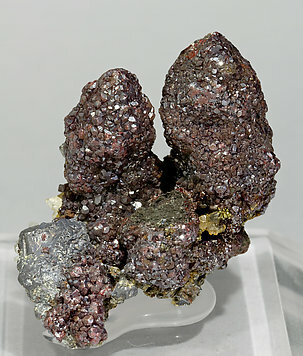 Spheroidal aggregates of short prismatic Proustite crystals that are translucent and have very well defined faces and edges. A novelty at Tucson 2019. 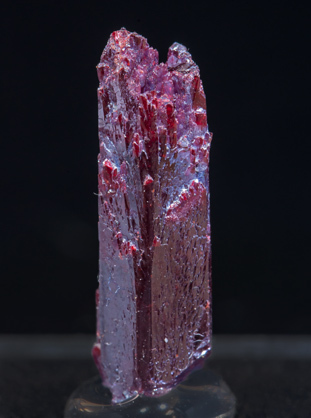 An elongated prismatic Proustite crystal with an excellent, very acute, pyramidal termination. 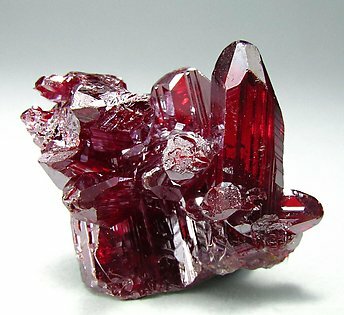 The crystal, transparent and very bright, has an extraordinary ruby-red color. 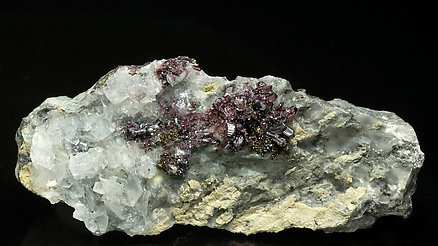 Proustite with Rhodocrosite and Quartz. It is very aerial, very esthetic, perfect, and shows a good contrast with the matrix. 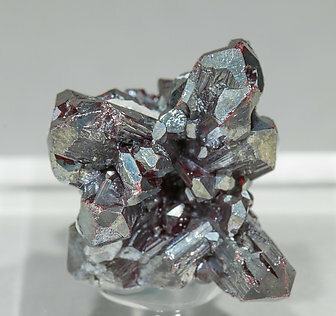 There is a first generation of darker crystals and a second one of redder ones. The specimen has been analyzed and we will send a copy of the analysis to the person that buys it. A very fine and excellent esthetic miniature. 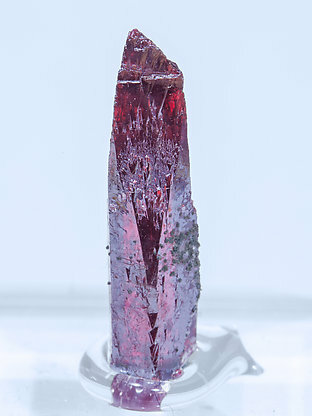 Proustite crystals are sharply defined, with perfect terminations and superb color, transparency and brilliance. We would like to emphasize its luminous cherry red color. 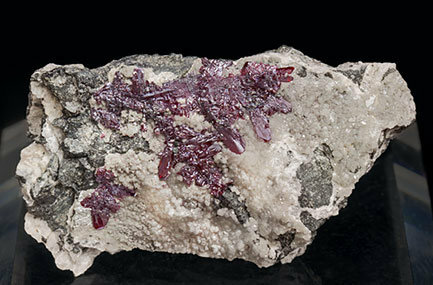 Very aerial stalactitic growth of small crystals of Proustite with a small group of cubic crystals of Acanthite at the base. Very aerial stalactitic growth of crystals of Proustite with a considerable size for the locality. 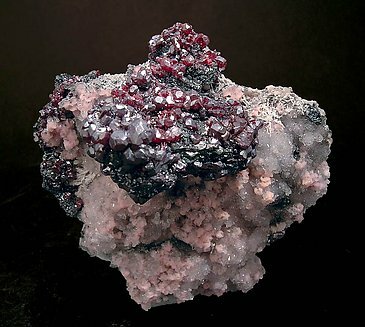 They are translucent, with a clear red color and are with concretions and small cubic crystals of Acanthite. A novelty at Tucson 2019. 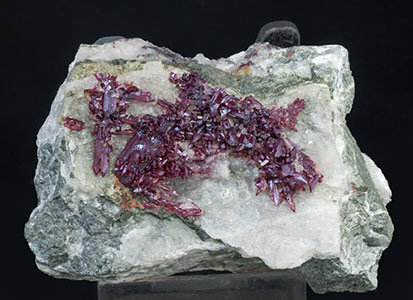 Prismatic Proustite crystals with excellent acute terminations, transparent, very bright and with an extraordinary ruby-red color. On a Calcite matrix. A novelty at Tucson 2019. Short prismatic Proustite crystals with excellent, very acute, pyramidal terminations. 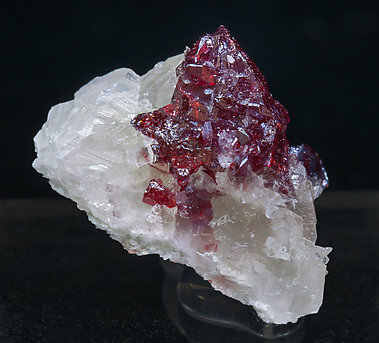 The crystals, transparent and very bright, have an extraordinary ruby-red color. On a matrix of Calcite crystals. 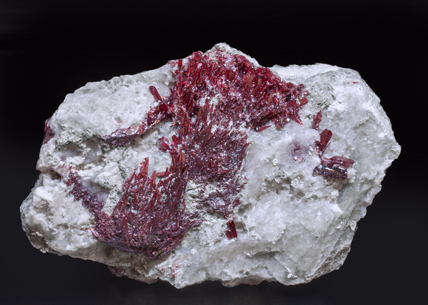 A dendritic cluster of very elongated Proustite crystals that are translucent, bright, have a vivid and intense red color and are on a rocky matrix, with massive Calcite. 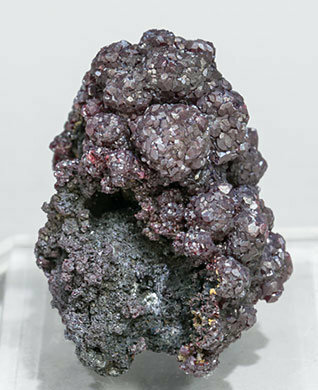 Proustite crystals are rare at Bouismas, and even moreso with this “Chañarcillo” shape, relatively new here. Furthermore the sample is an excellent miniature, very fine. 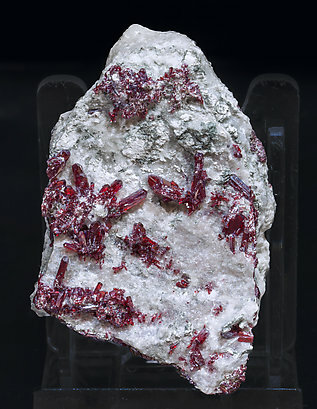 Aggregates of very elongated Proustite crystals that are translucent, bright, have a vivid and intense red color and are on a rocky Calcite matrix. 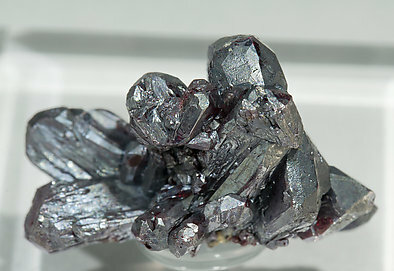 Proustite crystals are rare at Bouismas, and even moreso with this “Chañarcillo” shape, relatively new here. Furthermore the sample is excellent. A novelty at St. Marie 2013. Very fine and esthetic aggregate of crystals with very well defined faces and edges and acute and slightly rounded terminations. These Proustite samples, very different than those from Imiter, undoubtedly are one of the most interesting novelties from Morocco in the last years. A novelty at St. Marie 2013. 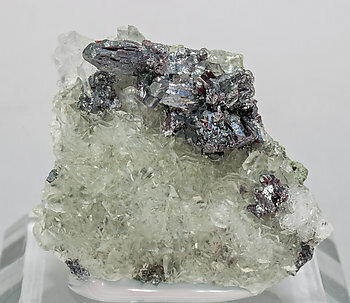 Aggregate, on a matrix coated by small rhombohedral Calcite crystals, of Proustite crystals with very well faces and edges and acute and slightly rounded terminations. They are translucent, very bright and have a very deep red color. These Proustite samples, very different than those from Imiter, undoubtedly are one of the most interesting novelties from Morocco in the last years. Very acute dipyramidal crystals, typical for the locality, and one of them clearly dominant. They are extraordinarily bright and show a splendid red color. On Calcite matrix. The sample is included in a box with an old stamp of the Dirección de Geología del Ministerio de Minas e Hidrocarburos de Venezuela, that we'll send to the buyer. A universal classic. 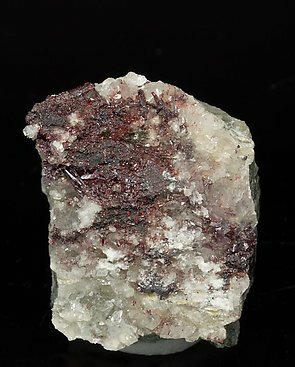 Aggregate of small prismatic crystals of Proustite. 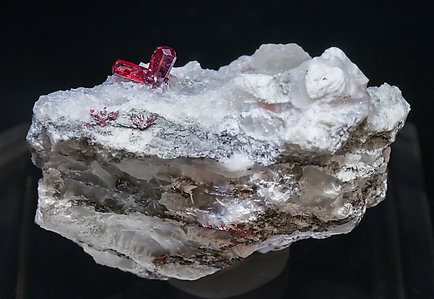 They have an intense red color, they are very bright and are on matrix, with Chalcopyrite and lenticular white crystals of Calcite. An old classic, it comes with a box with the stamp of the Dirección de Geología de la República de Venezuela. 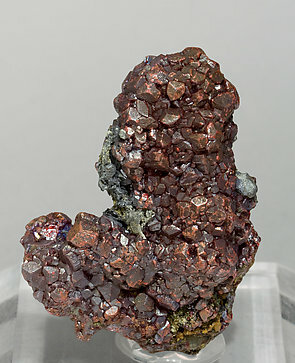 Group of Proustite crystals with well defined and bright faces and edges and intense red color. 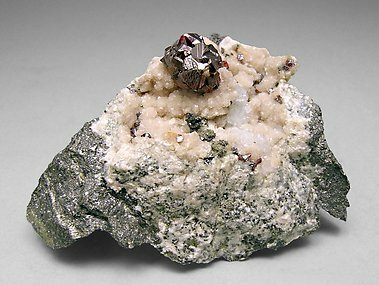 On matrix with manganoan Calcite and Quartz. 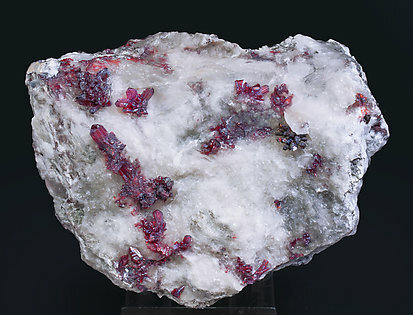 Spheroidal aggregates of very bright and very well defined crystals of Proustite that have a very deep red color. 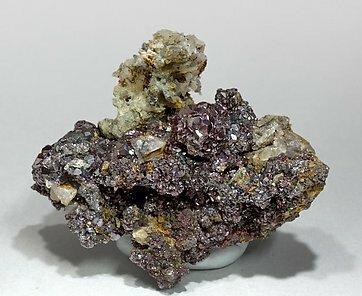 The sample has a very "fresh" appearance and it is on a matrix of Quartz and Siderite. Its quality is very high for the locality.